Alright everyone. This movie was not what I expected, but I left really enjoying it. It was something different because we see the story from a different point of view and the film doesn't follow the same format as other Star Wars "episodes." We see the events that happen before "Episode 4," and the film is about how the death star plans were retrieved. In this story we follow Jyn Erso (Felicity Jones), a girl who was raised by the empire at a young age but later raised by the rebel Saw Gerrera (Forest Whitaker). She is the daughter of Galen Erso (Mads Mikkelsen). He had a big role in creating the death star, but he has a conscience. Galen saw what he was doing and realized the terrifying destruction the death star could cause. So, he created a small weakness in the death star so that it could be destroyed, and the adventure to retrieve the plans with that weakness begins. 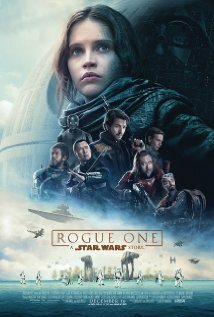 Jyn is accompanied by Cassian Andor (Diego Luna), K-2SO (voiced by Alan Tudyk), Chirrut Îmwe (Donnie Yen), Baze Malbus (Wen Jiang), and Bodhi Rook (Riz Ahmed). Together they are on a mission to save the galaxy from the emperor and Darth Vader (voiced by James Earl Jones). Their mission is driven by "hope," and they all have their own personal reasons for fighting back as part of the rebel alliance. We get to see a story blossom to an action-packed ending. It is not easy for them to get the plans to destroy the death star, but as we see if you trust in the force, anything is possible. There is not much I can say negatively about his film. I wish we got a more lengthy background on some of the other characters in Jyn's group. I also love lightsaber battles personally. Although there were not many lightsaber battles in this film, Darth Vader does not disappoint at the end. One of the final scenes where he uses his lightsaber on the rebels was pretty great. This story is about a group of rebels who risk their lives for the greater good, and their story is heartfelt all the way through. It is definitely a movie worthy of having the Star Wars name.